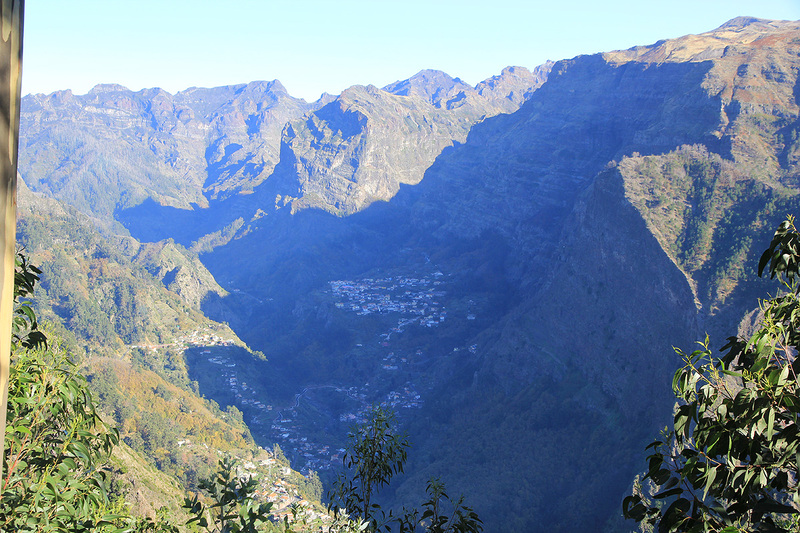 Drive from Funchal west towards Ribeira Brava. Exit the freeway after bridge, near hilltop, sign says Camara de Lobos. Turn left (uphill) and find your way towards the community called Jardim da Serra. Try to stay on the (somewhat!) bigger roads as you climb ever higher up in the valley. You should generally have the valley on your left side, as the road stays on the east slope. There may be a couple of signs (if you are lucky) saying Boca da Corrida, follow these. Higher up, you will eventually make a left turn, then pass a (a sort of official looking) sign (on your left) and enter the final uphill. This hill runs from around 900 meter to the trailhead above 1200 meter. 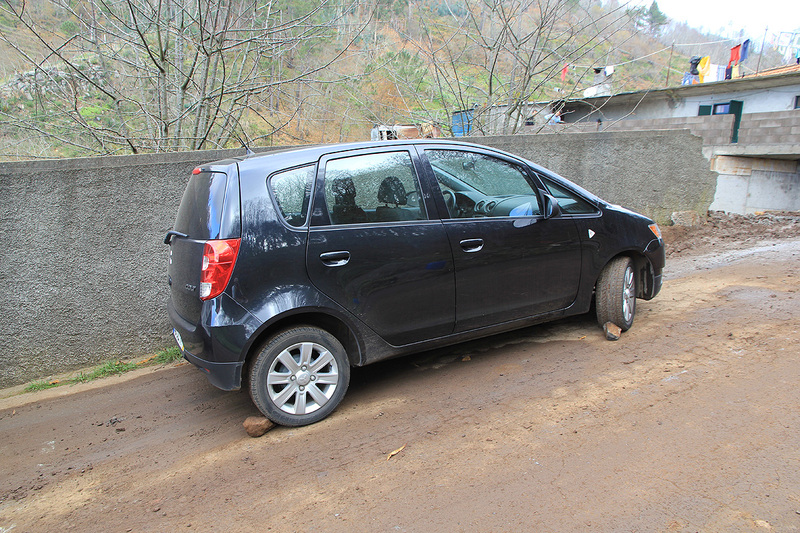 There is parking for a few cars, this location is N32:42.663, W016:59.206, elevation about 1220 meter. 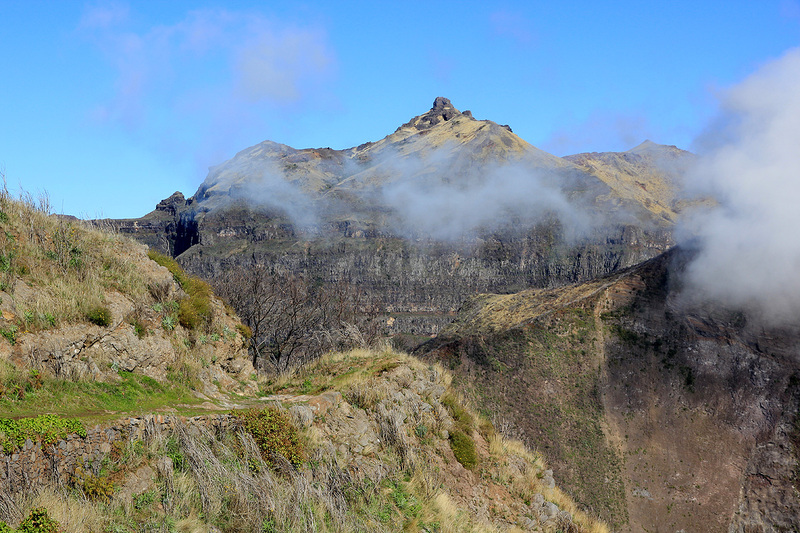 Walk along the big trail towards Pico Grande. 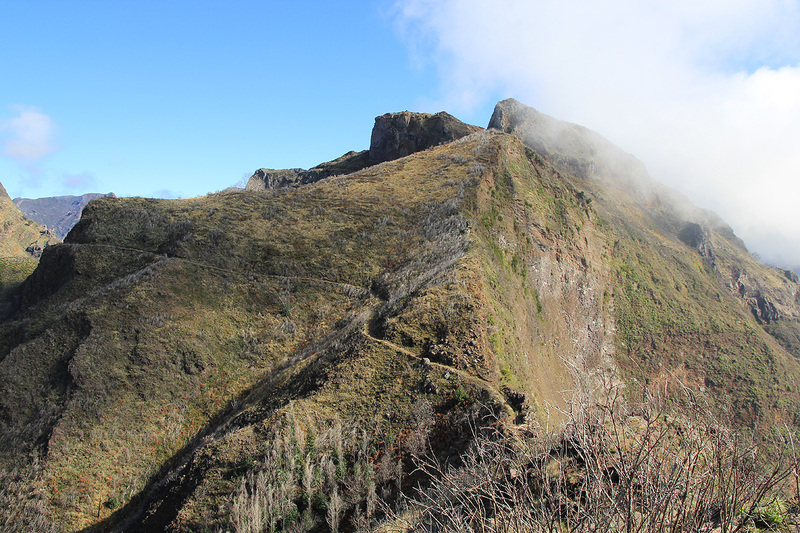 You will first descend to the col called Boca dos Corgos, with the mountain Pico do Cavalo up on your left side. Pico Serradinho will appear up front well to the right of the characteristic Pico Grande. Next, you cross the nice saddle Passo de Ares, before the trail traverses on the left side of Pico Serradinho. Continue along and around the first few corners, it is pretty obvious when you arrive at the point where one needs to leave the trail if this peak is your objective. The location is N32:43.498, W016:59.084, elevation near 1300 meter. Head directly up the large gully. The terrain is a bit cumbersome with thorns and burned branches. Eventually, you reach the saddle between the pointed sub-peak on your right and the main summit further left. The final stretch is easy and you arrive at a very fine summit. I drove uphill and somehow ended at the wrong trailhead. However, as a trail started out in the direction of Pico Grande, I did not immediately understand the mistake. 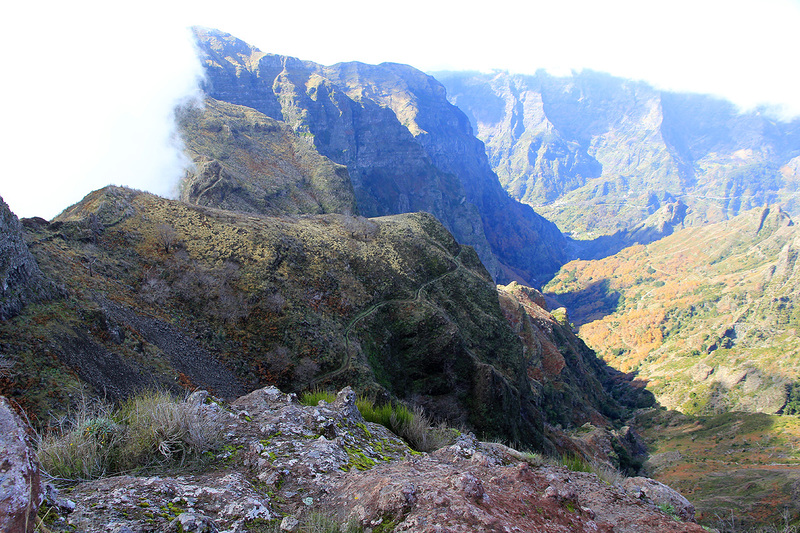 After 10 minutes of walking, I realized that this trail headed downhill, all the way down to Curral das Freiras. I turned around and started looking for thr correct trailhead. It turned out that I had driven the correct way first, but dismissed it as the road was all slippery dirt with a crew of workers dealing with some water pipe project. This time, I asked and got confirmed that my trailhead, Boca da Corrida, was indeed located higher up along this road. Only trouble that the road was (temporarily) closed due to the construction project. I parked and decided to hike up the road. This added a good 250 vertical meter to my trip. 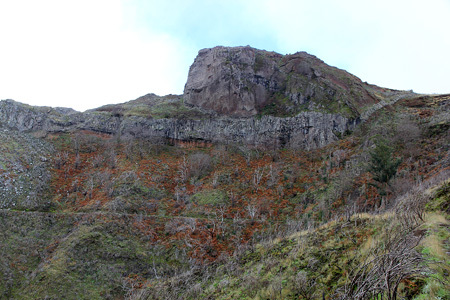 The trailhead was quite a nice place and it became obvious that this is indeed the easiest point of departure not only for Serradinho, but also for Pico Grande and Chao do Terreiros. I left the proper trailhead around 1130 and arrived at the point where off-trail climbing starts at 1215. The climb took about 25 minutes before I gained the top ridge, a nice place to rest and enjoy the scenery. 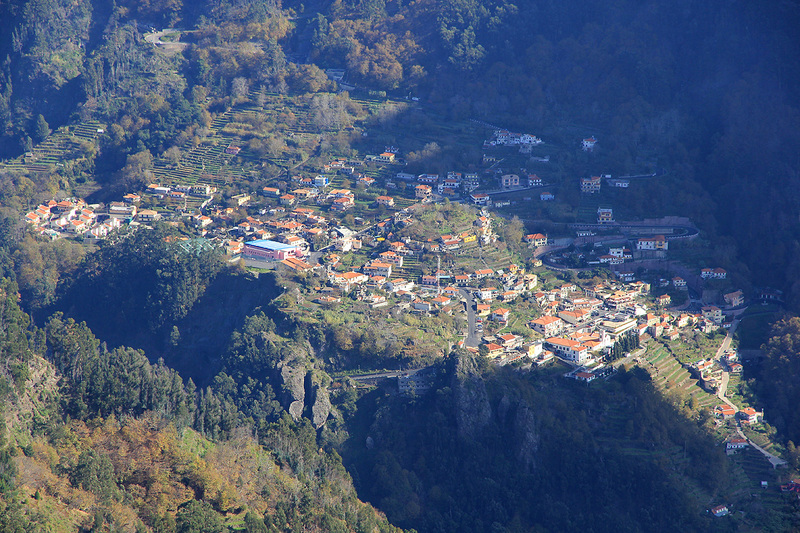 Pico Grande is right across, while the hidden village of Curral das Freiras is deep below. I left around 1250 and got back down to the trail along the route of ascent. Starting back, I decided to visit the two peaks along the way. 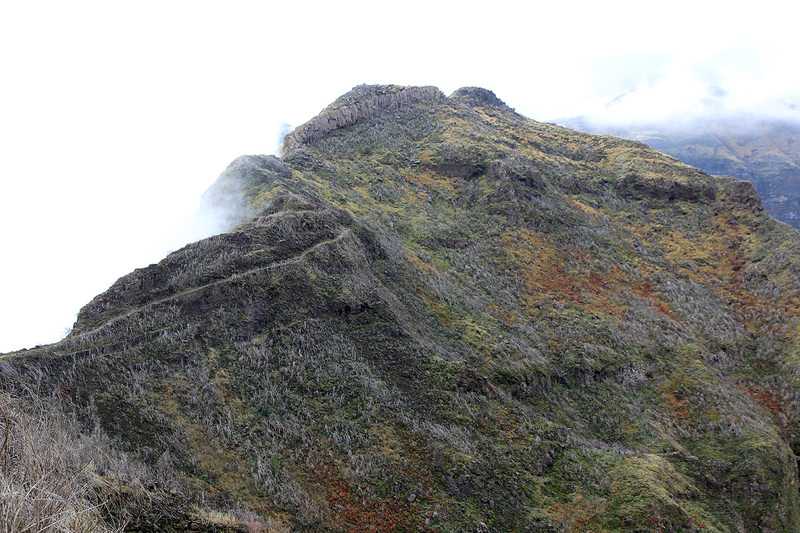 Thus, I arrived on top of Pico Cavalo at 1335. This climb was straightforward starting from the trail just before it makes the last curve around Cavalo (heading back). 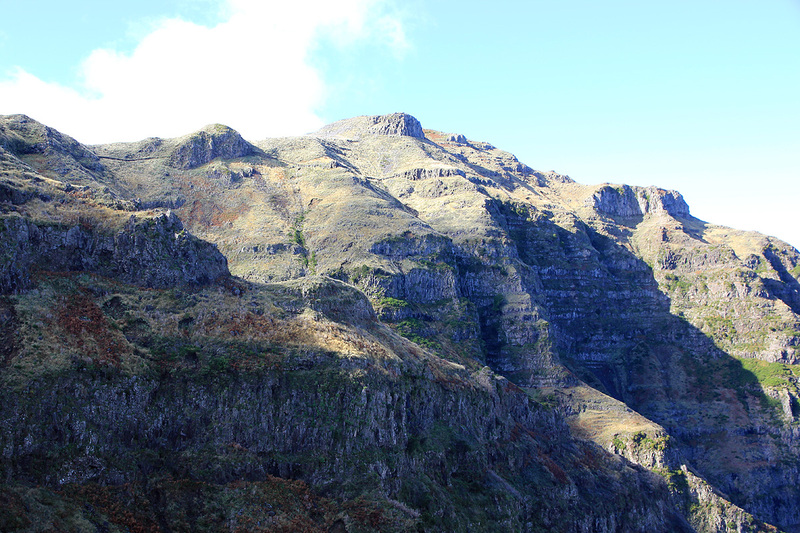 I continued along the trail until a dried out creek coming down from my right, seemed to provide a nice route to the top of the last peak, Eira do Ribeira. 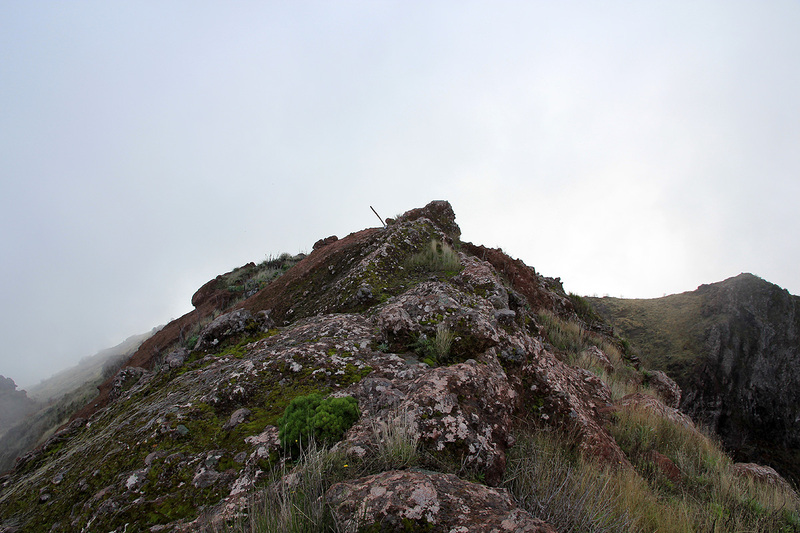 I was on top around 1420, then took some time to explore the terrain in the direction of Chao do Terreiros. Unfortunately, the place was fogged in. I first descended some easy slopes, then ascended a small hill with a wooden marker on top. From here on, the ridge seemed pretty level as it disappeared into the fog. I turned around here and headed back, then tried a different route in order to descend directly to the trailhead. I ran into a farmers road shortly before the end and followed it back to the trailhead. Descending the road, I was back at my car around 1520. 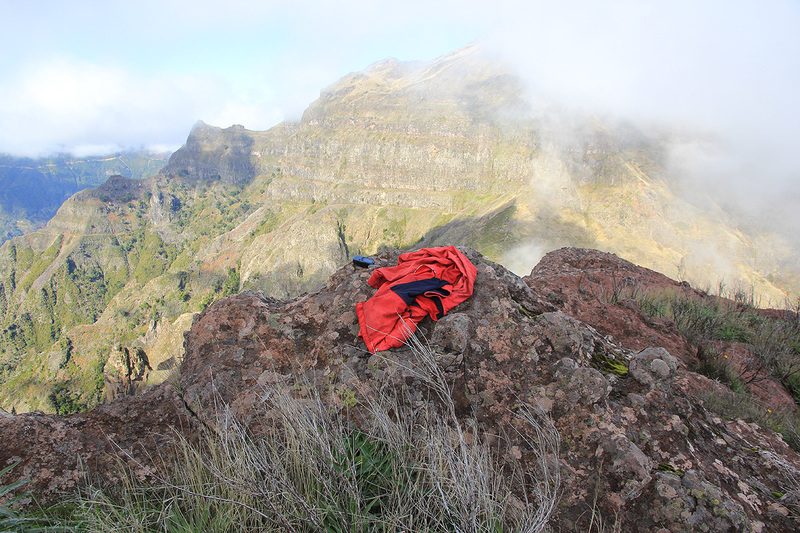 With this trip, the entire ridge (all summits) from Chao do Terreiros to Pico Cerco had been explored. Curral das Freiras, as seen from the trail. Looking across towards Terreiros from the trail.